A charity in Wales has introduced sleeping pods to give those sleeping on the streets somewhere to turn to for shelter. Homelessness is an issue in cities all around the world, with many people suffering through cold nights as they try to sleep outside while exposed to the elements. Last year, Newport, Wales recorded a peak in the number of homeless people, and charity Amazing Grace Spaces took action to try to improve the situation. The organisation aims to develop and provide accommodation and emergency shelter for those in need. People who are homeless are living everywhere. They are in parks, under bridges and in doorways. These are not safe places to be. We want them to go somewhere safe. These people are not on the streets because of their own volition. They need our help. 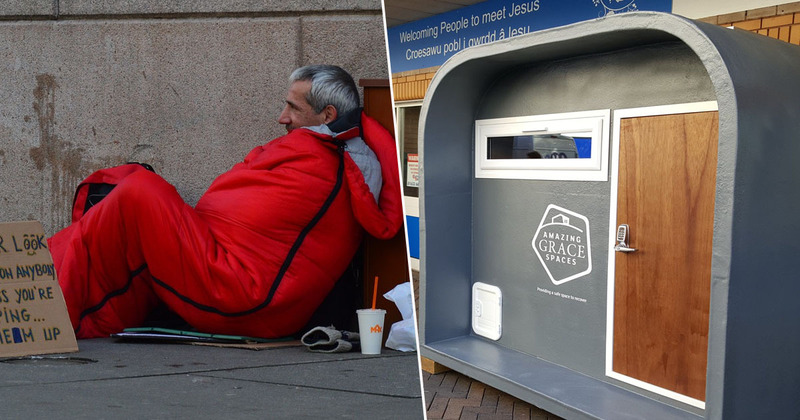 In October 2018, the charity unveiled two sleeping pods in Newport. The little cabins offer a warm, self-contained space with a bed, toilet and light, and cost between five to six thousand pounds each. Those in need can contact the charity and take shelter in one of the pods, and as a result, Amazing Grace Spaces hopes they’ll have the chance to build meaningful relationships with the people who use them. The way they work is by people getting in touch with either ourselves or an agency linked to us. They can sleep safely in the pod. There is no set time period for when the people would have to leave the pod. Over time we hope to build a relationship with that person and then help them further. The main aim is to get them off the streets. The charity encouraged organisations to back the initiative, so more pods could be introduced. According to the South Wales Argus, a local businessman gave permission for the pods to be situated on land at the back of his site, and as of February 2019, they were being occupied by two rough sleepers. Newport residents have shown their support for the pods, with one rough sleeper saying the scheme stopped him committing crime just so he could have access to a ‘warm prison cell’. This is great work from the charity and those who’ve helped make it possible. Anything that helps people without a home is good in my opinion. It gives an emergency lifeline to rough sleepers. Rather than battle the cold, they can be inside one of these great pods. The shelters truly are a life-saver for those with nowhere else to turn; what an amazing idea! Check out a similar movement started by an engineer in France here.